This St Patrick’s Day in Cardiff, flautist Emma Coulthart presents a concert of Irish music in partnership with CMC. The event also includes performances from Benjamin Dwyer and Jenn Kirby. Emma speaks to CMC about the project and the works she's performing. How did the idea for this concert come about? Having performed two concerts of Irish Music in Wales last year , I wanted to present something on St Patrick’s Day as an alternative to the usual expected greenery, to promote the mostly unknown talents of our Irish Composers. In my role in education here, we had a recent move to the vibrant and eclectic Chapter Arts Centre, which seemed like the perfect venue. I had a meeting with the director, and was delighted with the support and enthusiasm from the Chapter team, who are always keen to promote new work and ideas. It was also nice that the creative director Hannah, has an interest in Sheela-na-gig and had in fact commissioned one to be hung in the venue several years ago. Jenn Kirby is based in Swansea and has built up quite a following for her work . She attended my concert last year and invited me to be part of her NAWR festival, celebrating Irish and Welsh Music. Benjamin Dwyer is a Composer and performer I’ve admired for many years, and is Professor at Middlesex University, so I was very pleased that he and Jenn accepted my invitation to perform with me in Cardiff. You have worked with a few of these composers before now. What is it about their work that you are drawn to? My teacher, the legendary Doris Keogh, was a big advocate of living composers, and she also taught John Buckley, who I have known from a very young age. The composer I have know the longest is Fergus Johnston - another Doris Keogh pupil - and whose music I have always admired. Frank Corcoran’s delightful quirky writing and correspondence are both a joy. Frank has written a flute and piano piece which I hope to premiere later this year, but when I told him about this concert he quickly proposed a ‘Minute for St Patrick’ which was in by inbox in a matter of days. John McLachlan is a composer whose works are so well crafted, and who deserves to be better known. Benjamin Dwyer’s Crow is a piece I first heard when listening to William Dowdall’s CD Breathe while driving. I had to pull over, appropriately by a graveyard, and could not escape the compelling sounds. 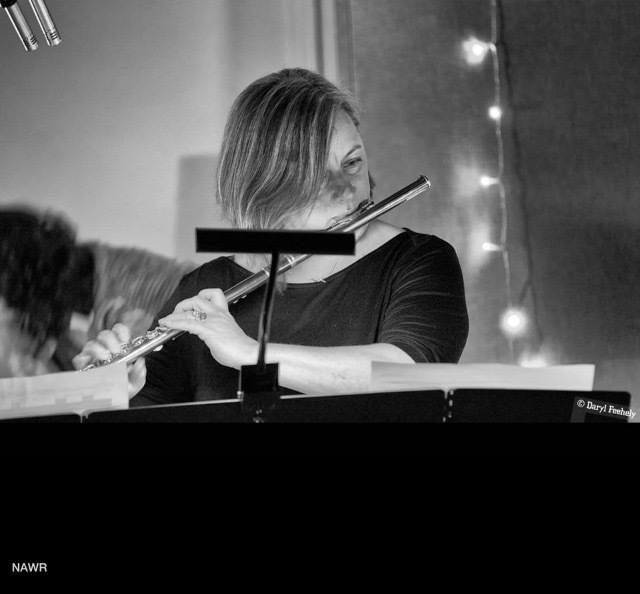 I was inspired to purchase a ‘Glissando’ headjoint so that I could perform the work, which I did in January last year. Working on the piece has given me the opportunity to play the flute in a way that really fits with my aesthetic of the instrument. The singing and playing, extended techniques and use of the Glissando Headjoint give the flute a new and exciting voice which I am continuing to explore. You’re giving a number of premieres in the concert. Have you worked closely with the composers as they were writing the works? The first premiere is One Minute for St Patrick by Frank Corcoran, which came about as a result of an email correspondence. Frank knew my playing quite well. As he’s written for me before, it was exciting to bounce ideas, and then days later have a new work, specially written for this performance. Both John McLachlan’s piece and John Buckley’s Oiseaux were already written, but never performed in the UK. I chose them because they represent very different approaches, McLachlan being more Berio-like, and the Buckley in a Debussy/Messiaen vogue. Benjamin Dwyer’s Hag! is part of his forthcoming work SacrumProfanum we worked together on the flute part, which is very challenging, and innovative. This piece demands a lot from the performer, as it combines flute with voice, and the two become intertwined to make one new ’instrument’. The character of the Sheela has to come alive, though vocalising, some of which is in the Irish language, gesture and furious flute riffs. It’s always rewarding when a composer pushes you to try new things and this piece is certainly not for the feint hearted! 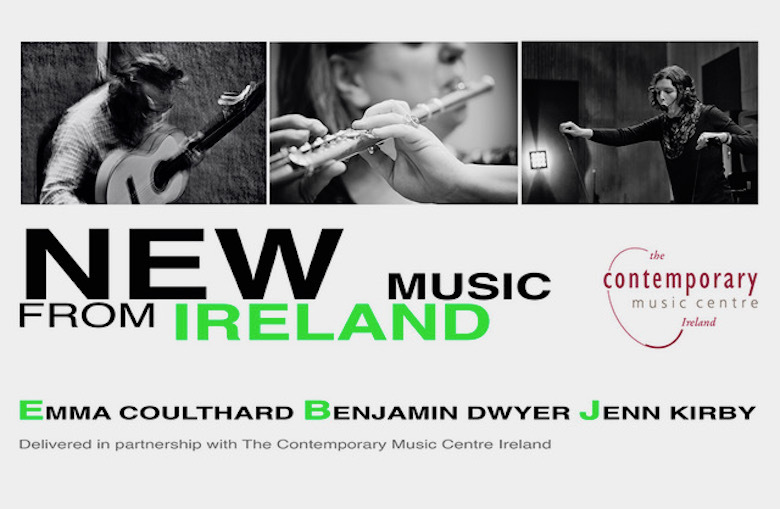 New Music from Ireland takes place on 17 March at Chapter Arts, Cardiff. CMC's Linda O'Shea Farren will MC the event and talk to the composers and performers during the concert. More on Emma Coulthard here.